Eight artisans received the prestigious Ordre des Lettres et des Arts honor from France’s Minister of Culture and Communications at a ceremony on February 17th. The honorees included Monique Bailly, head seamstress at Christian Dior Couture, and Patrice Rock, a master shoemaker at Berluti. Luxury industry artisans share a passion for excellence, authentic savoir-faire and a commitment to passing on their skills to new generations, contributing each day to renewing a unique cultural heritage. 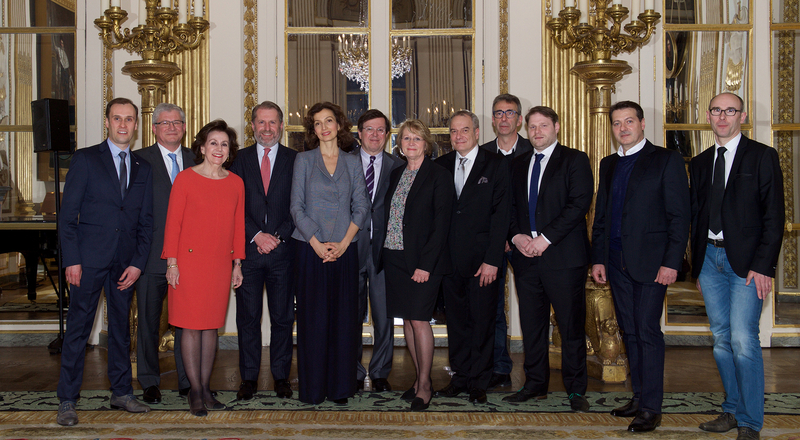 Eight of them from houses that are members of the Comité Colbert association of leading luxury brands were invited to the French Ministry of Culture and Communications to be decorated with the Chevalier des Lettres et des Arts insignia by Minister Audrey Azoulay. They included Monique Bailly, head seamstress at Christian Couture, who was honored for her work and congratulated by Sidney Toledano, President and CEO of the House. Also honored was Patrice Rock, a master shoemaker whose craft lies at the heart of the Berluti bespoke footwear workshop. He received his insignia accompanied by Antoine Arnault, Chief Executive Officer of Berluti. The Comité Colbert promotes French savoir-faire around the world and supports its preservation and transmission. Since 2006 some 31 artisans from its members have received the Ordre des Arts et des Lettres honor, and ten have been given the prestigious title “Maître d’Art”. These remarkable men and women embody the excellence of French luxury and serve as a model for the next generation.